Since the late 19th century the east end of London has been known for its extreme overcrowding and high concentration of poor and migrants. This situation was worsened as the remainder of London was redeveloped resulting in the demolition of slums and the increased movement of the poor into the already crowded east end. The construction of the East Indian Docks on the Isle of Dogs also caused the clearance of former slums and rookeries, with many of the displaced people moving into the East End. Bombing during WW2 provided a post war UK the opportunity to redevelop the east end. Closure of the last East End docks also assisted in this redevelopment. However some parts of the area still have the worst poverty in England. I took the Dockland Light Rail (DLR) which is an automated train system and not part of the “Tube” network. 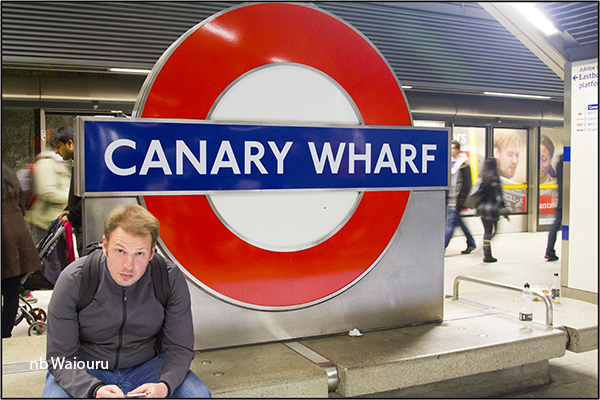 If I had done further research I would have realised there was no requirement to use the DLR as the Tube network extends to Canary Wharf on the Isle of Dogs. 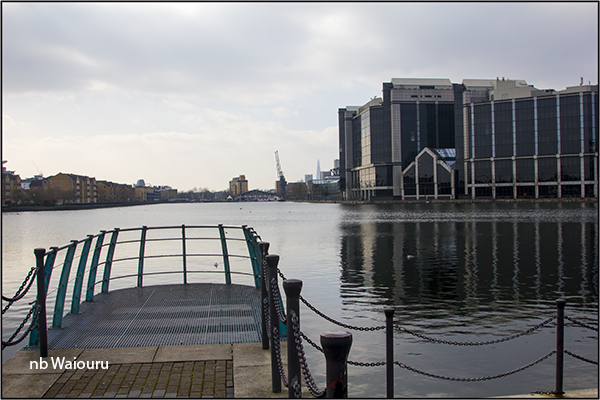 Nevertheless, it was interesting to use the DLR, particularly as I managed to view Limehouse Basin. 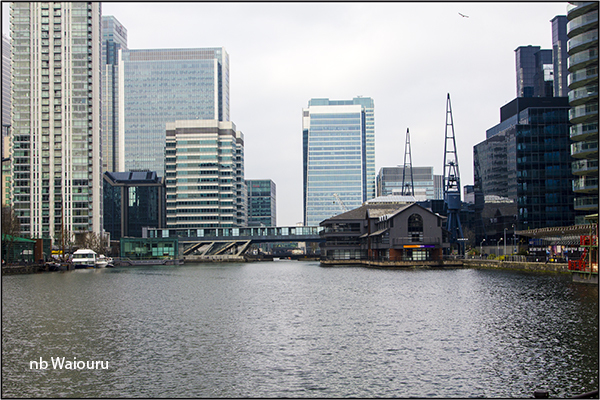 There is evidence of the areas maritime past with the docks retained but now surrounded by modern high-rise buildings. It came as a slight surprise to see CRT signs everywhere. The docks do not appear to be linked to the canal network but CRT is obviously responsible for them. Canary Wharf in the background. This area oozes money. Must be full of DINK bankers! There are few cars so I assume the Bentleys are all kept in underground car parks. The area is spotlessly clean. Either the residents are paying for an excellent litter cleaning service or they don’t discard! 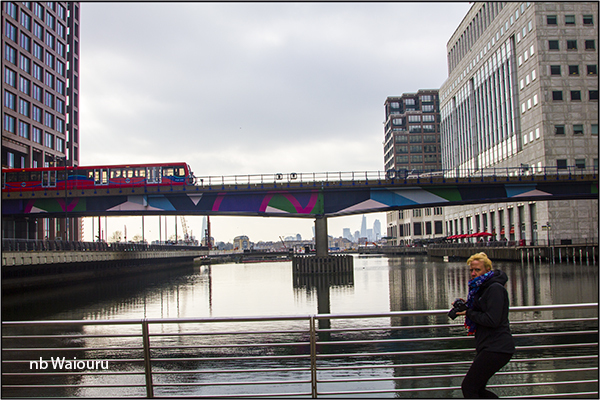 DLR train with “The City” in the background. Somehow I can’t see the local residents allowing CRT to connect these docks to the canal network. The thought of the wharfs being full of double breasted narrowboats belching wood and coal smoke into their environment wouldn’t be acceptable! 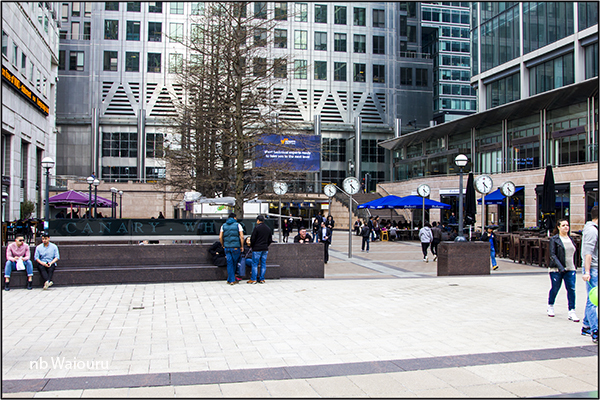 The centre of Canary Wharf looks very swish. One might wonder what effect an exit from the EU might have on the residents? 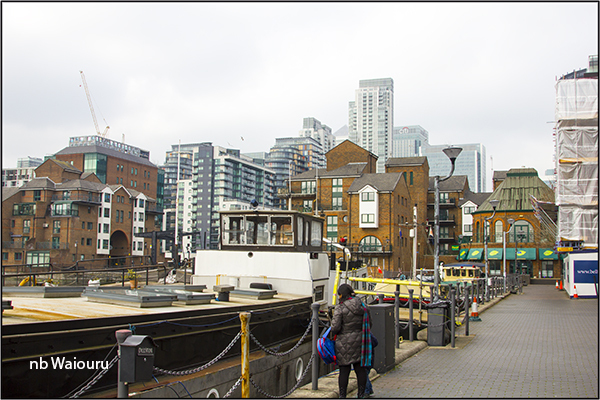 Can you see the Canary Wharf sign in the above photo? 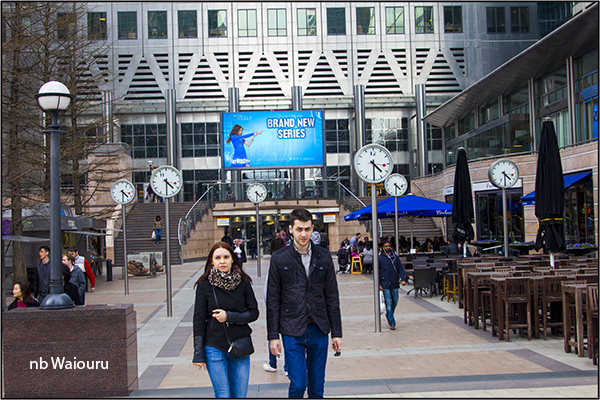 I suspect the clocks are showing the times at the various other financial centres around the world? The Tube station was very near here which made the return journey to Little Venice both cheaper and quicker. The clocks all show the same time -- it's just that they each have only one number on them, and they're all different. It's art, by Konstantin Grcic.